Want to Get Involved? CLICK HERE!!! The Recreated 74th regiment of foot started in the 1970's during the Bicentennial of the American Revolution. The first two companies were started in Maine (Battalion) and Massachusetts (Light). At the 200th anniversary of the battle of Penobscott members of both companies, at this point unknown to each other, meet for the first time. 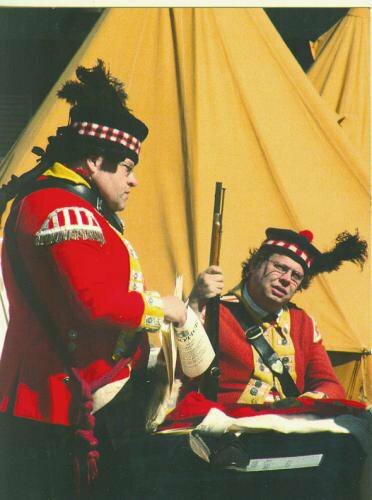 The Battalion and Light Company of the 74th Highland Regiment were started by a group of like-minded individuals who had a deep interest in the part that Scotland played in the American Revolution. As an organization the 74th has always been committed to a realistic portrayal of the Scottish solider and camp follower. Because of this commitment to history we have found that we are always working to improve our impression. We strive to document all items that we wear or use. All of our drill, clothing and camp life is documented as to having been in existence during the years 1777-1784. We have two uniforms that we wear: Number One Dress is the uniform that the Regiment entered service in. This uniform is Highland Dress consisting of the shirt, waistcoat, kilt, hose, shoes, full laced regimental coat, bonnet, dirk, broadsword, musket with bayonet, haversack, canteen and cartridge box.This uniform is worn mostly by the Battalion Company as they garrisoned Fort George. Number Two Dress is the uniform used on Southern campaign by the Lights and Grenadiers consisting of the shirt, waistcoat, shoes, overall trousers, full laced regimental coat, bonnet, dirk, musket with bayonet, haversack, knapsack, canteen, blanket or plaid and cartridge box. With each of these uniforms the men also carried personal items and eating utensils Each company of the 74th can turn out in early or late war dress. Camp life follows two set patterns. First is that of life in a fort. For the duration of the war 74th Battalion Company garrisoned Fort George in the Province of Maine. This lifestyle offers the solider a fully staffed camp kitchen with a varied menu such as roast beef, fresh vegetables, cheese, sweets, pies and birch beer. Soldiers’ tents are clean and comfortable with camp chests and extra bedding. Civilian laundress, servants and merchants are common to camp. 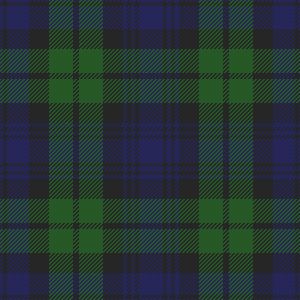 The second pattern is that of the regiment on campaign. This lifestyle offers only what the soldier and his mess mates can carry. Each mess does it’s own cooking with the rations that have been issued. The menu is often oats, rice, salt pork, dry beef, ship’s biscuits and portable soup. This menu can be supplemented with what the soldier could find while in the field. The men may have tents or a brush hut to sleep in, but sometimes the only cover is his blanket.